Written on September 12, 2017 . Posted in Architecture and Design. Yugon Kim (Critic, Interior Architecture) has just completed the first hardwood Cross Laminated Timber (CLT) structure in the United States for the Columbus Exhibition in Columbus, Indiana. 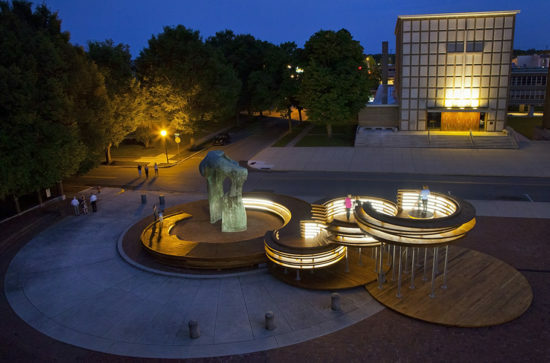 Yugon Kim was selected amongst 10 other Miller Prize Finalists to design and construct an installation in the main plaza of the city. 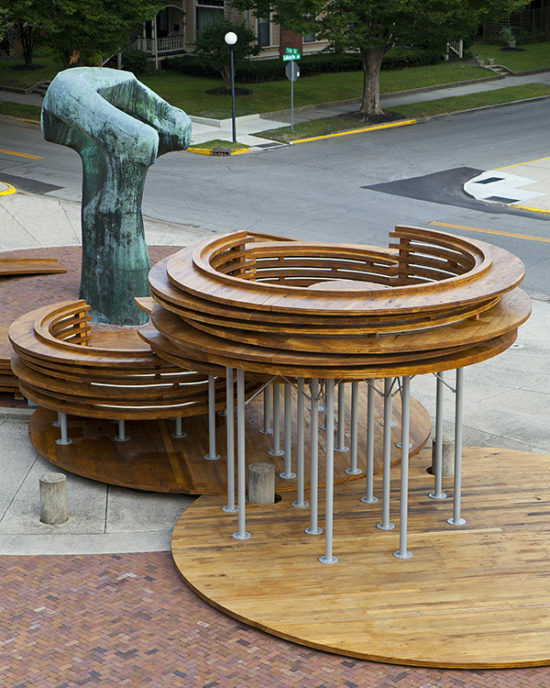 IKD the design practice in which Kim is a principal was also awarded $250,000.00 for a two-year United States Forest Service Wood Innovations Grant to fund the development of Hardwood CLT that was used to realize the project titled the Conversation Plinth. Acting as a demonstration project, the installation will be a catalyst for a new timber industry to emerge in the Mid-west by upcycling low-value hardwood sawn logs that are extracted from regional forests in Indiana and the mid-west. Indiana’s largest cash crop is hardwood, but over 55% of each log processed is of low value. The project was constructed from the first ever commercial pressing of Hardwood CLT with Project partners SmartlAM and Bensonwood. The idea is that low-value hardwood, such as grade 3 common oak, maple, and ash, can be used to create high-value Cross Laminated Timber which can then be used in commercial applications. CLT, a relatively new engineered wood product that is an incredibly strong, fireproof, lightweight alternative to steel and concrete, can be used to construct mid- to high-rise buildings in urban settings. In the United States, however, CLT is currently made only of softwoods; the hardwood variety is not available as it is in Europe. Hardwood CLT offers numerous benefits over softwood, included superior mechanical properties, material volume savings, and higher quality appearance in visible settings.